Do you long for woodlands and coastal bays? Come to our house by the east coast of Sweden, right by the bay Syrsan, where the bright pine woods of Småland meet the archipelago. 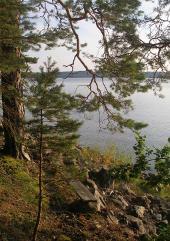 The cottage is secluded and located by a nature reserve with trails along the bay. A small boat is available for rent and there are excellent opportunities for recreational fishing. The house is architect designed with high ceiling and large windows overlooking the beautiful woodlands. it has a surface of 84 square meters. There are 3 bedrooms with 4 adult beds, 1 junior bed and 1 spare bed. 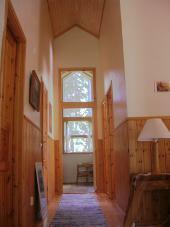 The living room is spacious with a large soapstone woodstove. The kitchen, which is in direct contact, is modern and well equipped. It includes stove, oven, microwave, coffee maker, refrigerator and freezer. WC, shower and washing machine are available in the house.